In recent years, neuroimaging has become an integral part of drug development for neurological, neurodegenerative, and rare diseases, offering highly valuable insight into structure and function of the brain and disease-related pathological changes. In preclinical research, several imaging methods, such as MRI and PET imaging, are essential because of the precious translational component—the ability to use the same tools and methods in laboratory animals and human patients. Despite the plethora of available imaging modalities, they all possess certain limitations, such as methodological complexity, costs, invasiveness, and poor sensitivity. That is why neuroimaging is a constantly evolving field, with new tools and methods appearing steadily, driven by demand and technological advancements and development in computational methods. In this tutorial, we present the applications and our implementation of a novel neuroimaging platform for preclinical research: functional ultrasound (fUS), a state-of-the-art method utilizing cutting-edge technology for high-speed Doppler-based imaging of cerebral vasculature structure and functional changes in cerebral volume (CBV). Being conceptually close to the well-established and popular functional MRI (fMRI), fUS has several key advantages, namely: unrivalled temporal and spatial resolution, outstanding functional sensitivity, straightforward interpretation of the readout, versatility and adaptability of the platform, and a more natural path to awake imaging. Functional ultrasound experiments were performed using a prototype fUS system (Iconeus, Paris, France), consisting of ultra-fast ultrasound imaging system, miniature probe with 128 ultrasonic transducers and acoustic lens, and motorized positioning system allowing precise positioning of the probe in three orthogonal planes. Plane-wave illumination of the brain at high frame rate (500 Hz compounded sequence with three tilted plane waves, PRF = 1500 Hz with a 15 MHz linear transducer) yields highly resolved neurovascular maps. All experiments were carried out according to the NIH guidelines for the use of laboratory animals, and approved by the National Animal Experiment Board. Charles River C57Bl/6J mice (6–8 weeks old, ~25–30 g) and SHR rats (~200 g) were housed in a controlled environment with food and water available ad libitum. Animals were anesthetized with intraperitoneal injection of Ketamine-Medetomidine solution (70 mg/kg ± 0.6 mg/kg) and placed into custom stereotactic holder, with O2-enriched air delivered to the nose cone. Core temperature, respiration, and heart rate were continuously monitored to ensure physiological stability of the animals throughout the measurement. Head hair was removed, skin moisturized, and covered with ultrasound gel. The fUS sensor was localized at approximately –1 mm from bregma, using the vasculature formation of the anterior hippocampus as a landmark for positioning. Our model was performed by administering mice six equal doses of oxaliplatin (i.p. 4.5 mg/kg each) in a period of 21 days. On the day following the last oxaliplatin injection, mice were subjected to two distinct tests for cool allodynia (acetone test and cool tail immersion test) to define the level of this manifestation of induced polyneuropathy. Subsequently, the animals underwent fUS imaging with sensory stimulation to assess the downstream effects of trigeminal neuropathy. Briefly, surgical induction of TBE was performed by infusion of the blood clots via catheter inserted into the external carotid artery. Ischemia was confirmed within 30 min from that by MRI and then, at 24 hr, with fUS. Oxaliplatin-induced peripheral neuropathy model: Using classical fMRI stimulation paradigm, we tested the tactile sensory processing in a trigeminal system with fUS. During a 6-min measurement, left whiskers were gently brushed by the experimenter in 4×30 s intervals with 1 min of idle time inbetween. Signal time series analysis from 200 px (~2 mm3) ROI placed in the barrel field cortex revealed significant reduction of response in oxaliplatin-treated animals compared to controls (See Figures 1 & 2). Figure 1. Tail Immersion (A) and Acetone (B) test results used to demonstrate thermal allodynia in animals dosed with oxaliplatin at baseline and on Day 21. These results demonstrate the hypersensitivity aspect of the model, but not the numbness often reported by patients. Figure 2. (A) Group fUS rCBV signal time series from ipsi- and contralateral to stimulation primary somatosensory cortex (n = 4/group). (B) Quantification of the stimulation epochs as integral area under the curve (AUC), mean ± SEM. Individual statistical activation map of unilateral mechanical whiskers stimulation in mice (t-statistics, thresholded to p < .001, FDR corrected). Map constructed using 4×30 s stimulation blocks GLM model (dashed line on the figure above). Thromboembolic stroke model: In this piece of work, we explored the opporunity to utilize fUS as a structural imaging tool in rats for visualization of the ischemic area in thromboembolic (TBE) stroke. When imaging in rats, the transcranial fUS signal attenuation caused by the thick skull bone becomes an issue that can be addressed in three different ways: 1) surgical thinning of the cranial bone over the imaging area, 2) infusion of ultrasound contrast agent (microbubbles), or 3) use of younger animals with thinner, less porous bone structure. Here we have tested all of this options, with representative examples of fUS images shown in Figure 3, A–E. Figure 3. Rat fUS imaging. different pattern of the deeper vasculature. Here we employed fUS to measure the brain rCBV responses to pharmacological stimulation with reference compound (nicotine) and compared it with our historical data from the BOLD phMRI platform. While similar overall, the nicotine response in fUS was more resolved and showed a pronounced “initial dip,” a post-stimulatic signal decrease, and 5×-higher magnitude, indicating higher sensitivity and resolution of fUS vs. phMRI (Figure 4). 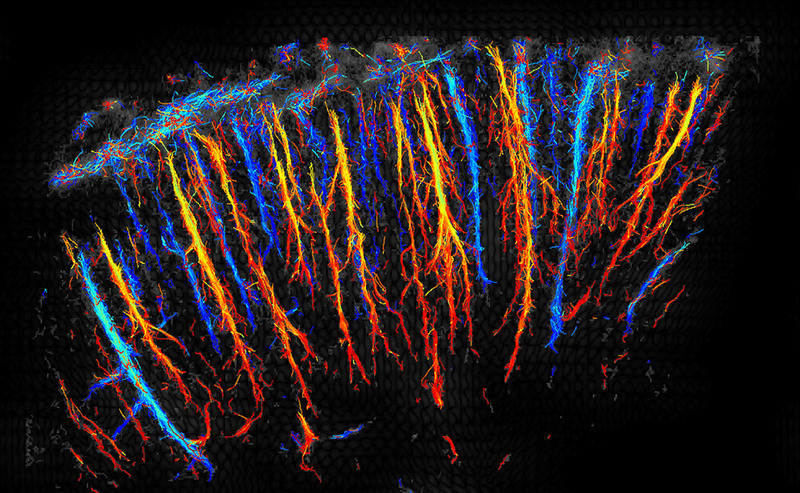 In vivo fUS is a cutting-edge research tool for research in the CNS area, and it is particularly useful for preclinical drug discovery due to its versatility, noninvasiveness, and high sensitivity. These features make it highly applicable for longitudinal functional studies in neurodegenerative and rare disease mouse models. In such studies, fUS makes it possible to run a panel of readouts, such as vascular imaging, connectivity, and pharmacological and somatosensory stimulation trials, in the same subjects in multiple timepoints. To uncover trigeminal sensory aberrance aspect of the OIPN mouse model that is in line with the clinical data and not possible to address with conventional tools applied in these studies. 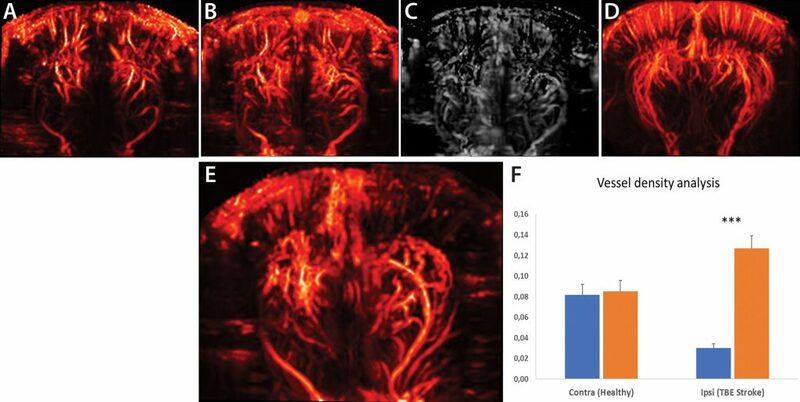 To visualize in high detail and quantify the vascular pathology in an acute TBE model in rats. To compare the rCBV fUS response to nicotine administration with BOLD phMRI, showing greater sensitivity of the fUS.